Our homeschooling method is clearly within the realm of a Classical Education, even with the modifications we have made for Amber's chronic illness. One of our favorite curriculum publishers happens to be Memoria Press, so it was with utter glee that we agreed to review the Famous Men of Rome Set. Each book has a color cover with a glossy finish. The books are the height and width of a standard textbook, but more like a trade paperback in other respects. The Famous Men of Rome book is especially impressive with color reproductions as well as black and white prints of well known artwork on the Roman period interspersed throughout the book. The Famous Men of Rome Student and Teacher Guides are nearly identical, except the teacher's guide has answers completed for all the sections. Additionally, tests to be administered every five lessons are also included in the very back of the Teacher's Guide. The tests are printed twice, once with and once without answers. 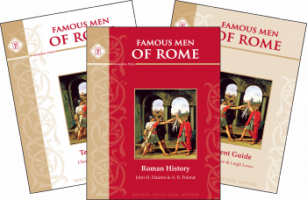 The Famous Men of Rome set is designed to be a full year Roman history curriculum for fourth through eight grade students. The student and teacher guides are divided into 25 lessons, each corresponding with a chapter in the book, plus five additional review lessons and tests. Each of the 25 weekly lessons are structured the same, so the students and the teachers both know what to expect. While it may look on the surface this is simply a workbook to be completed by the student, it is actually a complete history study of the Roman times with very few workbook type assignments. And even though it's not strictly necessary, the student will benefit greatly from teacher involvement in discussions, as suggested in the lessons. (Left) Working on her vocabulary. (Right) Comprehension questions, map activity, and a drawing activity. Each of the 25 regular lessons begins with a section on Facts to Know, which includes important people, concepts, and places all with a clear definition of each item. The teacher is encouraged to use these facts as memory work, as is so often a base in a Classical education. Next in the lesson is a Vocabulary section that emphasizes difficult or possibly unknown words. The student is expected to go over these words with their teacher using the context in the book to learn the definition. Each lesson also has a set of Comprehension Questions to help the student cement the important facts and concepts from the reading. Students should write the answers in complete sentences to assist in writing practice. Finally, the lessons have an Activities section which varies in types of assignments. There is timeline work, maps, discussion questions, drawing on included pages, writing prompts, and more. An appendix in both books provides all the supplemental information and worksheets needed for the assignments. There is even a pronunciation guide that comes in handy when dealing with Roman names. We absolutely loved this history set from Memoria Press. However, we generally don't take a whole year on any of their sets, instead choose to work one lesson per day or every other day. Of course having selected to move quicker, we don't always have time to complete every activity suggested. Even though the set is designed to correlate to a Classical education, it is easy to adapt to other styles. That's one reason we love this set. (Top) Working on her vocabulary again with a kitty friend and entering dates into her timeline. (Bottom) A full lesson! On history lesson days, I first had Amber read over the Facts to Know section in the student guide, then read the listed pages in Famous Men of Rome. We aren't big on memory work at our house, so for us the Facts to Know section is really just an explicit definition of terms in the reading. Next, Amber worked through the vocabulary on her own. She was not to use a dictionary, but instead defined the words from the context used in the reading and from her knowledge of Latin. During our discussion time each day we reviewed her definitions and talked about what each word did indeed mean. Amber was also assigned the comprehension questions to complete before we met. Occasionally, Amber did not have an answer to a question, and that was alright too. We discussed the question and worked out the answer together. At the end of our daily history time together, I assigned Amber one or two items from the activities section to complete. Occasionally, if I planned on utilizing discussion questions from the Activities, I did warn Amber in advance so she could prepare. Amber is always game for map assignments in history, and we are very pleased how easily the Famous Men of Rome set integrates geography. The student and teacher guides both contain maps of the Roman empire, ancient Italy, ancient Rome and Modern Europe. The maps help put the study of Roman history into perspective. While the set also provides a perfectly sized timeline page in the appendix with suggested timeline dates in the lessons, we decided to create a more detailed timeline using our preferred iPad timeline app since timelines are probably Amber's favorite history project. It was Amber's responsibility to chose several dates from the reading each day and enter specifics of the events in the app. I also had Amber double check that all dates recommended in her student guide were entered onto her timeline. Utilizing this method also allowed us to continue with the same timeline past the Famous Men of Rome book. (Top) Reviewing her timeline and preparing to enter dates; Another set of comprehension questions and map activity instructions. (Bottom) Working on the comprehension questions. In general, at our house we do not utilize tests provided with any curriculum, but that doesn't prevent us from completing review assignments. The review lessons in the Famous Men of Rome set are quite extensive and include facts, quote identification, geography, important dates and people. Some of the review lessons we completed orally during our discussion time, while others I assigned to Amber as her task for the day. I love how these assignments gave me a good way to gauge Amber's knowledge and understanding without the anxiety of a test. We highly recommend the Famous Men of Rome set for anyone studying Roman history. It is an all inclusive Classical learning tool that guides both the teacher and student through Roman times through a variety of assignments and discussions while still being highly adaptable to many learning styles. Please check out what other members of the Review Crew thought of the Memoria Press Roman and Latin sets!